DIN rail mounted controllers with scalable performance. 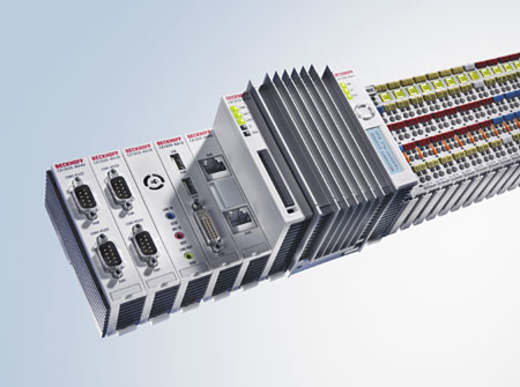 The Beckhoff embedded PC series combines the best of both worlds: Industrial PC and hardware PLC. The modular design allows for a flexible combination of interfaces like CANopen NMT master and NMT slave, local and remote I/Os, Ethernet, USB, DVI and VGA, EIA-232 (RS-232) and so forth. The TwinCAT automation software turns the CX embedded PC into a powerful PLC with up to four tasks and an NC for several servo axis. Even special functions such as flying saw, electronic gearbox and cam plate can be realised. The embedded PC thus becomes a controller that covers PLC, motion control and visualisation tasks with a single hardware. Under Windows CE.NET, thanks to the real-time capability of the operating system, user tasks written in high level languages can be processed in real-time in parallel with TwinCAT. The CX1500-M510 (master field-bus connection) and the EL6751 (EtherCAT terminal) CANopen NMT masters support all features of the FC5101 CANopen PCI card. The flexibility of the CANopen implementation allows one to connect and control almost any CANopen NMT slave device: the CX Embedded PC family are versatile and efficient CANopen controller. For CANopen slave functionality there are the CX1500-B510 (slave field-bus connection) and the EL6751-0010 (EtherCAT terminal) interfaces. They also support all CANopen communication types. Several CANopen and other field-bus interfaces can be connected to one CX system. Local I/O on the devices is provided by the bus terminal or EtherCAT terminal series.